Keenan and Allison met as camp counselors at YMCA Camp Kitaki near Louisville, Nebraska (between Lincoln and Omaha). It only seemed appropriate to photograph their engagement session at the camp. Luckily, Keenan still works for the camp occasionally and we had no trouble getting access to the property in the off-season. I had never been to this particular camp, but it was such a gorgeous property along the Platte River. We visited some of their favorite spots, including the cabins they had stayed in and hiking trails through the property. The session made me want to go back to camp again. One of my favorite locations we found was this bench at the top of the hill overlooking the Platte River. With the fall colors starting to change and the light near the river it was a scene straight out of a movie. 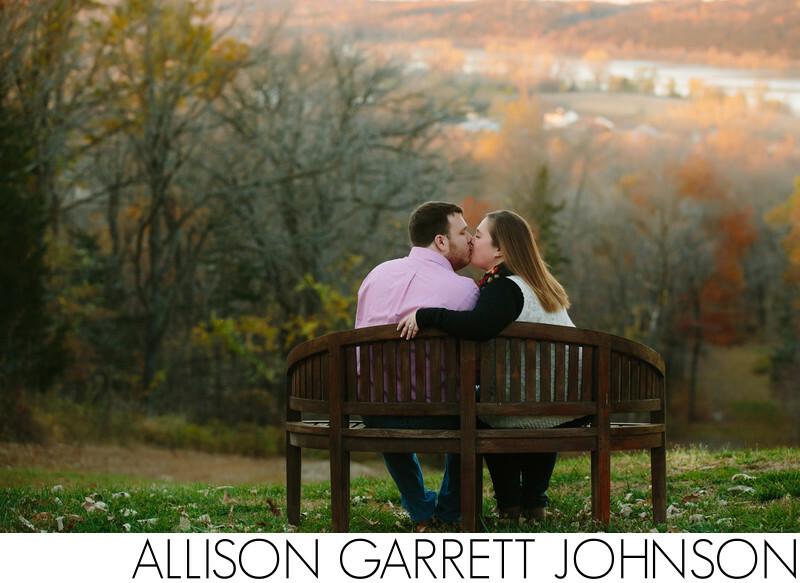 I have photographed weddings and sessions all over Nebraska and the varied scenery throughout the state is one of my favorite parts. Nebraska is most definitely not flat and I love the variety I can find throughout the different regions. Location: YMCA Camp Kitaki, 14917 E Park Hwy, Louisville, NE 68037.